This guide will walk you through viewing individual survey responses, as well as running a simple report. 1. Return to the Survey Manager to view responses. Select the desired survey from the navigation pane on the left to expand that survey’s dashboard. The dashboard displays a histogram of recent responses. 2. 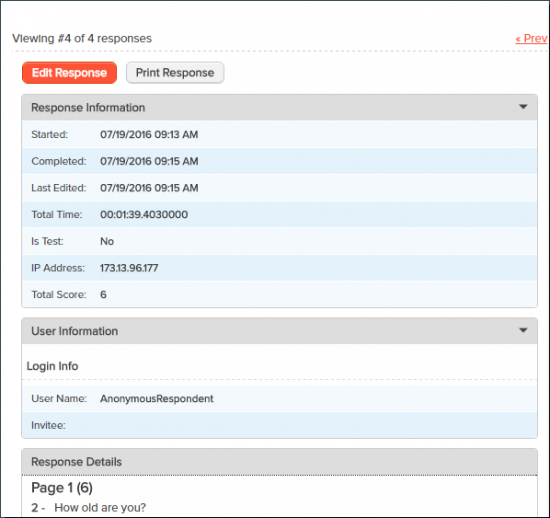 For a detailed view of collected responses, select Responses -> View Responses from the Analyze drop-down in the survey dashboard or survey editor. NOTE: Responses highlighted in red are test responses. 3. Select a response to view an individual response’s detail. 1. 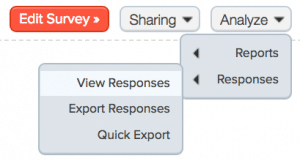 Select the Export Responses button at the top right of the Response Manager to view export options You can also export responses from the Analyze menu in the survey editor or survey dashboard. 1. To create a one-click report with charts and graphs for all your survey questions, select Reports -> Quick Report from the Analyze drop-down in the survey dashboard or survey editor. **Note, the Quick Report creates a one-click report by using the reporting preferences in your System Settings. If you’d like to change your preferences, click your username in the upper right corner and then System Settings -> Report Settings -> Report Preferences. 2. If you’d like more control over your report creation, you can instead select Reports -> Custom Report or Reports -> Report Wizard from the Analyze drop-down. For more details on how to create these reports, please see our Custom Report Guide or Report Wizard Guide.